As Cody and Joe trek through a sea of sand dunes and into the mountains of Oman, they face the threats of heatstroke and dehydration while revealing how nomads were able to survive in the hyper-arid environment for millennia. And now for my thoughts about Sri Lanka. At the end of Part 1, Joe and Cody are at the bottom of a waterfall and decide that getting to the top to see if there might be people there is a good idea. I agree. But Joe has to ascend up a pretty steep area to take that look. He says that the risk is worth the reward. But he doesn’t even look a bit farther to see if there might be an easier access. I’ve hiked in a lot of places with similar looking waterfalls, and by traveling just a bit one can usually find an easier way up. What if you can get the reward with taking the risk? Isn’t it already a pretty big risk to be in a survival situation? Anyways, Joe gets to the top and there are elephants, elephants traumatized by the long civil war in Sri Lanka. So, does Joe go back down the way he came? It may be a bit risky, but at least he’s familiar with it. No, he runs to the other side of the waterfall. He doesn’t sneak away from the elephants. He runs. He runs near the edge of a cliff face. He runs near the edge of a cliff face to an area he has no idea if he can get safely down from. This is smart survival? No, this is a chance for Joe to look macho. I’m looking at this vine and it’s about as round as a baseball. I know it’s got the tensile strength to hold me; I just don’t know how well it’s anchored. If you don’t know how well it is anchored, you first check the anchor point carefully to find out how well it is anchored. Of course, Joe starts down it and it gives way, and we got our cliffhanger at the end of Part 1. The network should be aware that programming of this nature must be produced and marketed in a responsible manner with the highest level of regard for the safety and health of the hosts, production personnel, and members of the viewing public. Emphasis added. 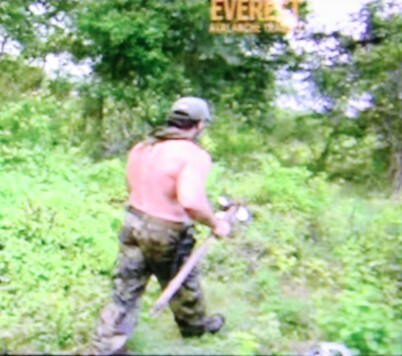 Dual Survival is supposed to be teaching the viewing public about how to survive. The cliffhanger is teaching the viewing public to take stupid and unnecessary risks in order to act macho. And I bet there were just too many of these for Cody and he objected. Cody has always (just look at his two books) advocated for teaching over drama. There have been instances in which people have gotten lost and used the survival shows to help them survive. 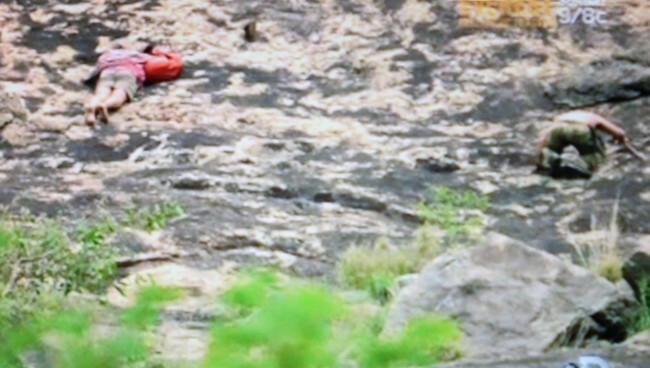 Here’s one, Watching ‘Survivorman’ likely saved two brothers lost on climbing trip, that credits Les Stroud’s show. Can you imagine some poor folks trying a vine descent (“but I learned it on Dual Survival!”) and getting killed instead of rescued because of it? The show should be responsible, and this sort of producer-generated drama lacks that. From the waterfall, Cody and Joe continue in a different direction, and I’d like to tout the benefits of bare feet in the jungle environment as they travel along. Here they are heading down a stream. When you are barefoot, that’s really easy to do (if it’s not too deep). I do it all the time. If you look closely at the picture, you can see Joe with his boots kind of trying to walk along the edge of the stream. The jungle itself is too thick to walk through comfortably, but Joe also can’t walk easily in the stream because of the boots. So he’s stuck kind dancing along the edge. By the way, right about here Cody makes fire with a fire piston. It’s pretty interesting. I recall that Les Stroud in Survivorman tested on out (store-bought) on one of his episodes. But in this case, Cody just happened to have with him a piece of copper with one end conveniently sealed, and an O-ring of just the right diameter. Yeah, it was fun to watch. No, don’t rely on it as a viable survival technique. Pfft. Later, the two of them come across a lake. It looks fairly shallow, because of the dead trees sticking up. But that just tells you it’s not 60 feet deep. There are some fun scenes in which we see them try to reconstruct a raft. After doing so, they head out across the lake, poling it along. But it gets too deep, and so they need Joe (macho-Joe) to get in the crocodile-infested water to swim-push the raft along. Again, if you don’t know, why take the risk? Instead, they could have gone with less drama and more safety just by taking a slightly longer path. They could have poled the raft around the edge of the lake, and then they would have been assured it never got too deep. But they way they wouldn’t have had the rating-attracting drama of worrying about crocs, and the added drama of the flotation barrels springing leaks. On the other side of the lake, they continue trekking. And I want to point out something that really would determine survival that is ignored. Here’s Joe walking along shortly after the raft incident. What about foot maintenance? His boots and socks have to be soaked. That’s how you get blisters. I’ve seen it a lot back when my boys were boy scouts. That is what you really need to pay attention to if you want to survive. If you ruin your feet by not taking care of them, then you really will have trouble surviving. Now that is something that would be worth showing, even if it isn’t macho-crazy. The producers also put in some more crazy drama near the end, when Cody and Joe are climbing a monadnock. After a few words about crumbly rocks, here comes one! You can maybe see the rock going right between Cody and Joe (closer to Cody). That was so obviously staged for a bit of mini-drama. Please. But they again show the advantage of bare feet. 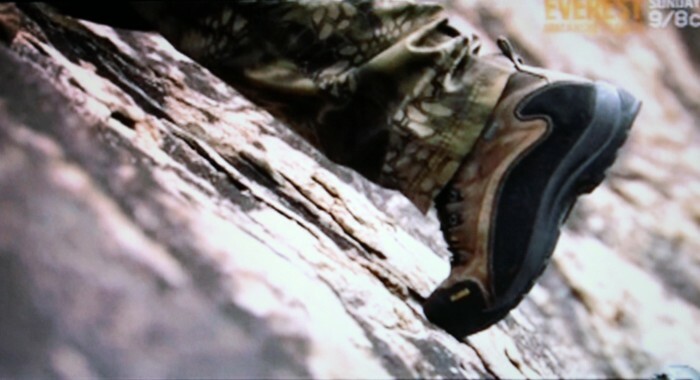 Here’s Joe heading up the rock slope with his boots. He was unsurprisingly slipping a fair bit. There’s just no way to get a very good grip. Now look at how Cody climbed. He gets way better surface contact; he gets way better feedback on his grip. It’s a perfect example of what bare feet can do for you. From the top of the monadnock they see farms, and head down to be rescued by the farmers. Being Sri Lankans, it’s not surprising that they know what works on a Sri Lankan farm: bare feet. It’s a little difficult to see due to the vegetation, but the bare foot of one of them is clearly visible on the far left. Maybe Joe should have taken a hint.